Especially here in Phoenix, Auto AC Repairs can be the major difference between loving your vehicle, and hating every moment you spend inside it. At Tucker Tire and Auto, We understand that in the hottest summer months, you need to be able to rely on your car Air Conditioning, as well as the technicians that conduct the repairs. 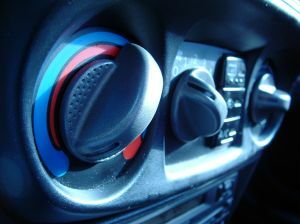 The fact is, after an auto AC Repair; the system should be able to maintain its effectiveness for quite some time. Because it is a sealed system, it should require very little maintenance and run perfectly for an extended period of time. Understanding a little bit about how the car air conditioning system works can help you take the proper steps in making sure that your vehicle remains cool and comfortable throughout the future summers. Freon – This is the coolant which is recycled through the system. Freon is actually changed from a gas to a liquid and back again. Through this process, heat is actually drawn out of the air in your vehicle and blown outside of the car. As long as the system remains sealed, the Freon in your vehicle should remain effective. Compressor – this is by far the most expensive portion of your Car AC System. Its job is to help the Freon gas make the transition from liquid to gas; this process actually changes the temperature of the Freon and allows the cooling process to run continuously. Compressors will eventually need maintenance but maintaining the compressor is much more cost effective than replacing the part altogether. Coolant Lines – This is where most drivers will experience problems with their vehicle AC. The reason for this is because the automotive air conditioning system must remain a closed system if it is to work. This issue is compounded because the Freon in the system also acts as a lubricant to keep everything running smoothly. Without Freon, the compressor can seize up, water can be introduced, and other damage can occur. Though this is essentially the short version of things to watch for, the information here can be massively helpful in understanding what your Car AC needs to remain in the best condition possible. Arizona summers can be harsh, and in the worst months, it can be dangerous to go for long drives, especially if there are young children in the vehicle. We understand that our customers need to be able to trust that their vehicle AC will continue running strong, despite the weather. If you have any questions about what should be done for your vehicle to best keep your air conditioning running, feel free to contact us and let us know what we can do for you. Our staff is standing by to make sure that you get the attention you need, and that all your questions are answered.